One of the most common questions I get regarding Classical Conversations is “You are just filling their head with rote memorization. They don’t understand half of it. What good is that? All that stuff doesn’t even mean anything to them.”. While it is quite true that many of the facts we memorize mean virtually nothing to my children (what 5-year-old cares about Newton’s Laws of Motion? ), there is a purpose and a path in our style of schooling that begins at the beginning. With young children who, like sponges, absorb every ounce of data around them. We all learn from infancy by rote memorization. How to speak by repeating the basic words our parents babble to us. The alphabet, the Pledge of Allegiance, The Lord’s Prayer. Kids can sing every song in their favorite movie. Recite entire books that are frequent bedtime stories. All these things are retained and recalled because of rote memorization. I’d like to share a little from Leigh Bortins book “The Core “, and then a story of my own to demonstrate these principles in action. From “The Core”, by Leigh Bortins. “How can we teach our children to memorize a broad range of information? Let me prove to you that all people are (potential) geniuses, with brains designed to store, manipulate, and retrieve large amounts of information through rote memorization. Imagine the grocery store you shop in the most. If I asked you to tell me where the eggs are so I could run right in and grab them, would you be able to do so? Of course you could. The average grocery store carries over 10,000 items, yet you can quickly tell me where to find most of them. Why? The store is organized by category, and you have shopped in the store repeatedly. In other words, you’ve seen those organized items over and over again, and the arrangement by category makes it easy for you to memorize the store’s layout. You can categorize 10,000 items from just one store. Even more amazing, you can do the same thing in very many stores. You also have memorized many details about every item. You know which products are fresh and which are processed. You can comprehend the ingredient labels and you can make choices based on quality and price in comparison of an item in one store to the quality and price you remember from other stores. You can go home and taste the item, determine if you like it, and then remember that sensation when you go to purchase that product again. You learn which butchers point you to the best meat and which produce managers will get you the latest shipment of fruit from the refrigerator in the store’s warehouse section. You learn the store’s marketing system and discover when the best times to shop for the best prices. You manage whole fields of data associated with tens of thousands of items in just one of the very many stores you visit each week. You are a human data machine. You can categorize and memorize anything. Leigh goes on to describe how building the brain’s knowledge store works and how facts and data are then shelved along with associated information. But I’d like to give you a real world example of this grocery store of the mind and how kids naturally shelve items to pull from at a later time as they memorize information. 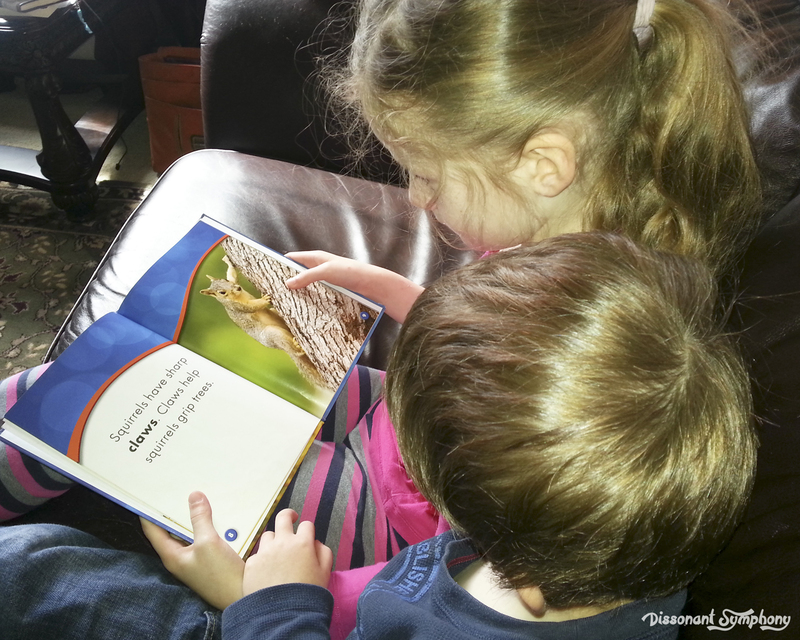 Today, my kids and I read a book about squirrels. Just a little Scholastic non-fiction early reader we picked up from the library last week. Nothing earth shattering or really very impressive. 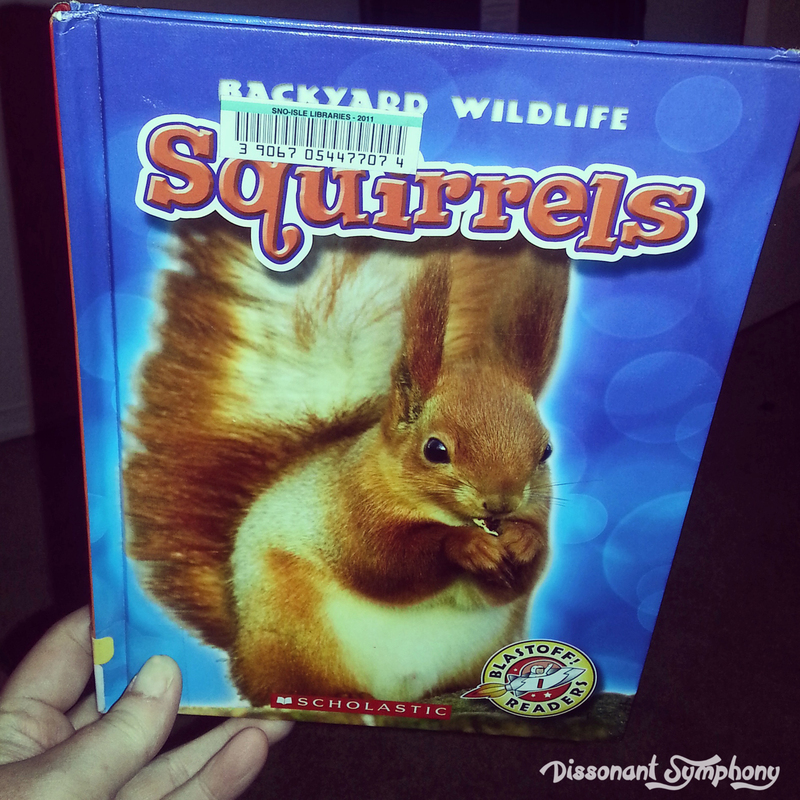 Just a simple book with basic facts about squirrels. As soon as we opened the book, my kids began associating information inside with shelves already created from their memory work. “They live in grasslands, forests, and deserts.” read the book. “Hey! Those are biomes!” exclaimed my kids, and then proceeded to rattle off our “Seven Types of Biomes” song from CC Cycle 2. Their “Science Shelf” now has a new piece of information to file alongside the list of biomes they memorized two school years ago. A few pages later was a hilarious connection. 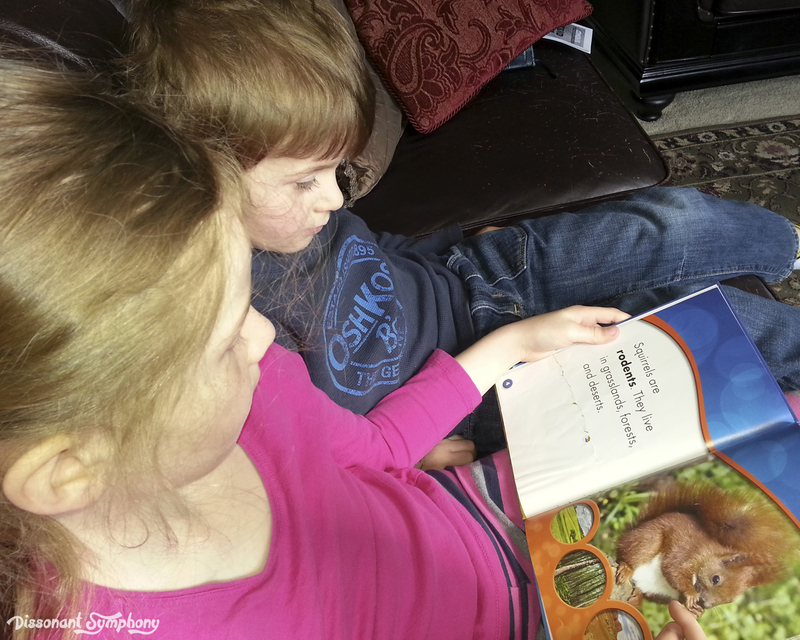 While reading “Squirrels have sharp claws. Claws help squirrels grip trees.”, my daughter remarked “I know what a clause is. It’s a group of words that contains both a subject and a verb. How on earth does that help squirrels grip trees?”. Then laughed her head off at the “wonderful” joke she’d just created. You can file humor on your memory shelves as well apparently, because her “English Grammar” shelf now has a wisecrack about squirrels on it. And finally, another item for the “Science Shelf”. 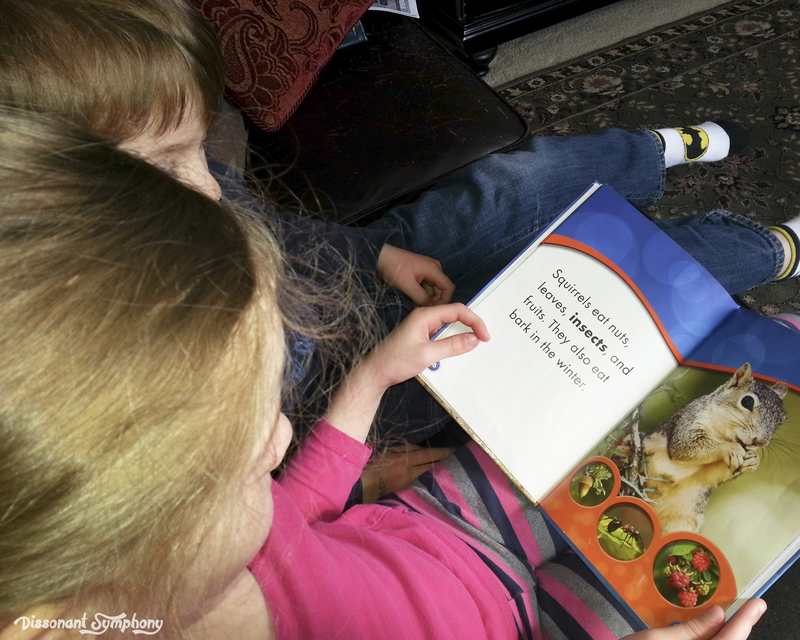 As we read all about what squirrels eat, my children immediately decided what kind of consumer its diet made it. Another song from two years ago. My children are able to quickly recall associated information because they have well-organized the aisles and shelves of their mind through memorization. This is just a snippet of dozens of examples I could give you from the past two years demonstrating the amazing ability of the mind to categorize and retrieve information when it’s stored in an orderly way through repetition of memory work. My kids have made connections to memory work while at the Seattle Art Museum, listening to sermons at church and reading passing street signs. They’ve delighted in retrieving facts related to Presidents on our money, who was the ruler of Rome when Jesus was born, that a friend’s name means something in Latin, and conversations with their Great-Grandparents about world history. With each of these connections, a light bulb goes off, another piece of information is categorized and stored, and my kids are able to see how knowledge is woven together across disciplines. Science, History, Math, and Language all blend to create a beautiful tapestry of learning. As my children grow, their ability to reason, form opinions and express them well will build from the base of knowledge contained in their mental grocery store. As easily as you can run in for a pound of ground beef, they will be able to articulate a logical historical basis for supporting freedom, parse sentences, mentally formulate mathematical equations and experience awe at scientific discoveries. All blossoming from rote memorization.